Polyface Farm's choreographed plant-animal symbiosis heals the landscape, the community, and the eater. A theatrical performance mixing humor and bomb-shell food system analysis, Salatin's stemwinder educates, entertains, and encourages. First rate pictures let the audience take a virtual tour around this grass-based multi-species livestock farm. Salatin's passionate explanations offer up a veritable epiphany on food and farming. 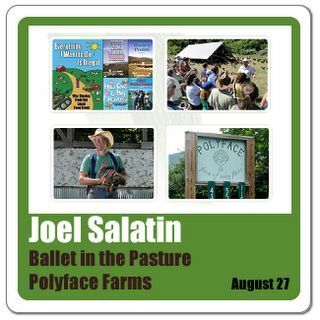 Life-changing and ultimately memorable, Ballet in the Pasture is Salatin's signature performance. Joel Salatin is a masterful speaker whose humor and positive energy guarantees a rewarding course. Over two information packed days Joel takes us through his entire family farm operation from the production of pastured poultry (eggs, broilers, turkeys), salad bar beef, pigaerator pork, forage-based rabbits & forestry products through to the relationship marketing approach his family business has developed that has made Polyface Farm the internationally recognized, and strictly local farm it is today. If you are a farmer, understand your potential to renew and inspire your local community through clean food. If you live in town, discover the power you have to patronize your local farms and decouple them from wholly unfair corporate forces. Help your local farmers transform their farms into profitable and wholesome operations producing food you can trust. Become instrumental in the conscientious transformation of the dangerously toxic and destructive food production status quo towards the wholesome regenerative model the Polyface Farms have proven wildly successful. With Joel you’ll reveal the astonishingly obvious steps we all must take towards a future that is beyond sustainable. Act to regenerate your land, water & community.